The Fort of Moltz the Very Goonie is the fifth level of World 5 in Yoshi's Island DS. It is a mid-world "fort" stage and is the last of its kind in the game. The first part of the fort consists of some stationary platforms, with very many Koopas and Para-Koopas trying to stall the Yoshi. After, Yoshi needs to get on a moving platform while avoiding the above mentioned enemies, several Blow Hards and spikes down below. Then, Yoshi needs to get in a pipe, where another moving platform awaits. This time, when on the platform, Yoshi should be careful to not touch any spikes or thorns while riding on it, as it results in instant death. That brings him to the first checkpoint. Then, Yoshi goes on another moving platform, encountering the same dangers, but this time, Bullet Bills appear and try to hinder his progress. 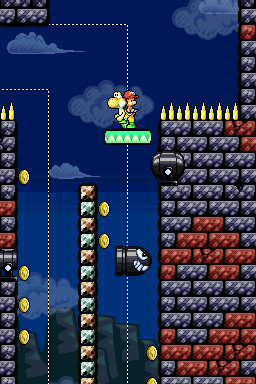 After avoiding some Bouncies and going across another moving platform segment, Yoshi goes into a pipe, where a checkpoint ring awaits, along with some stone platforms that try to crush Yoshi. After getting past that hazard, Yoshi goes into a Blow Hard infested area, where Yoshi has to quickly navigate his way through to find the pipe before he gets hurt. Yoshi then finds another checkpoint along with a platform that does not move when Yoshi stays on it, but does move when he jumps away from it, while avoiding thorns and spikes. After that, when Yoshi ground pounds down a nearby wall, he reaches a pipe which leads him to yet another checkpoint and a rocket, where he goes into space, avoiding Rocket Guys and planets. When warped back, he finds the last checkpoint and the boss door. Inside waits Moltz the Very Goonie, as the stage title implies. He is an enlarged Goonie who is summoned by Kamek and fought while falling from the sky. Yoshi can defeat Moltz by ground pounding on his head a total of three times. The player must watch out that a failure of pounding leads to the instant loss of a life. Yoshi can then access the next level. This page was last edited on April 15, 2019, at 02:15.